Welsh National Opera is keen for more young people to be moved by the power of classical music. The Under 30's ticket scheme offers hugely discounted tickets to main house operas and concerts across its touring venues. The Under 30s £5 ticket offer runs throughout WNO's 2013 - 14 season. There are 50 tickets available at every performance and to qualify you must be under 30. Seats are located within first three price bands. ID is required for each ticket purchased and is subject to availability. 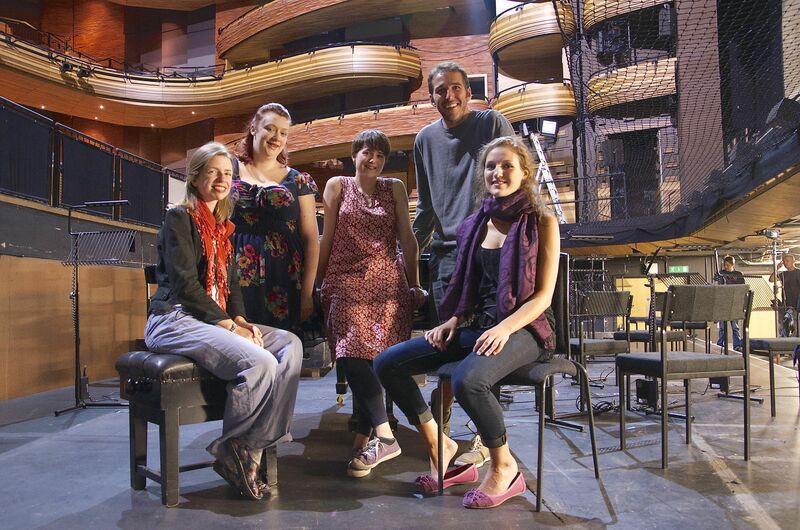 Many staff at WNO will be able to take advantage of this scheme – and they say opera has already transformed their lives. Musician Sarah Thornett first picked up the violin at the age of four and went on to study music at the University of Birmingham - and yet she didn't discover opera until earlier this year. The 24-year-old from Bournville, who now plays first violin with Welsh National Opera, says she just did not realise what she was missing. "The first opera I actually watched was when I was on trial with WNO," says Sarah who joined the Cardiff-based company in March. "I watched the dress rehearsal for Madam Butterfly. "I was under the impression that I hated opera – I just thought it was about sitting for hours and hours listening to people wailing. I thought there was something very pretentious around opera." But for Sarah, who also took a Masters in music at Royal Northern College of Music in Manchester, that first performance was a revelation. "I thought I didn't like opera but actually that was because I had never seen it. When I went to the dress rehearsal it was really amazing. I thought I might be bored but the whole thing just flew by. It was so emotional that I was crying before anything bad had even happened." And now a whole new world has opened up to her. "I recommend opera now to lots of people. When WNO were in Birmingham in the summer I got some tickets for some people here who had never seen an opera – and they loved it too." For Sarah, it is all about giving opera a chance. "I have had people say to me they wouldn't understand it because it is all in a foreign language but there are surtitles so that isn't really a problem. When you go you just become totally involved in it." Sarah is now looking to tick off a few more operas. "I would really like to see La Bohème. It is the classic love story that everyone knows. I was in a concert performance of it with City of Birmingham Symphony Chorus and Andris Nelsons at Birmingham Symphony Hall and I could hear it all and knew something heart-wrenching was going on but I would really love to see the full production. "And WNO are doing Tosca this autumn which I am really looking forward to. It is a really exciting time for me and I am looking forward to each new season and learning all of the new operas that we will be doing. Most of the orchestra know a lot of these works inside-out but for me, most of it is still so new. It is nice to still be learning." Sarah believes education is also the key to encouraging other young people to give opera a go. "I am a real fan of going into schools and community groups and demonstrating what goes on in an opera. A part of it is giving opera street cred. Some young people may feel they can't say 'I'm going to go and watch an opera' because it wouldn't be a cool thing to do. But if they all get introduced to opera, and understand it, they will feel differently about it. "People just need to be exposed to it. Even though I started playing the violin at four I thought I hated classical music until I was about 14 when I learned more about it. Then I said I hated all contemporary music until I was about 18 and learned more about it. And then it was the same with opera. "If we take it into schools and other places where people are active they will be exposed to it. The sooner someone has heard the music and seen everything that is going on on-stage then they will like it." WNO assistant stage manager Karly Hill, aged 26, admits to being another company member who initially missed the attraction of opera. "I had always been involved in theatre and did lots of am dram stuff and musical theatre in college," she says. "After college I did normal jobs, working in call centres, but still went to see a lot of theatre, musicals and ballet – but never opera though. I can't really say why not – I think I had a preconceived idea of opera being for older people. "Then I applied for a technical theatre apprenticeship with the Wales Millennium Centre and Welsh National Opera and did that for a year. That was my first real opera experience and I got to see it from every aspect." And it was here that Karly, of Barry in South Wales, discovered a new love. "The sound of opera is so amazing. I have been with WNO for a year and a half but I still get butterflies from hearing that sound. It is live and the singing is for real, they are not using mics or miming. It is a totally live experience." Principal timpanist Patrick King believes companies need to be prepared to be different to attract young people into the auditorium. "Our repertoire choice is really accessible for young people," says the 29-year-old. "We have the traditional stuff but also stuff from composers from the twenty first century. This season is really interesting as we have The Tudors with Donizetti's Anna Bolena, Maria Stuarda and Roberto Devereux alongside Puccini's Tosca.
."People think opera is really expensive but with our offer it is actually cheaper than going to the cinema. It is great value for money to see live performance. A lot of my friends had never been to opera before but have tried it because of my encouragement." Patrick, of Great Yarmouth, says company initiatives are only part of the story. "It is certainly our job to encourage young people to try it but I would also love to see more opera on TV. I think that would encourage more people into coming to see it. We need to make classical music and culture more mainstream." For 25-year-old Sophie Rashbrook, opera has become a real passion. And one that she is able to share time and again by giving pre-performance talks with WNO. Sophie was part way through her studies in French and Russian at Cambridge University when she undertook a year in St Petersburg. And it was there she developed a love for opera. "I didn't really get into opera until my third year of university," she recalls. "When I did my year abroad in Russia I was playing cello at the Conservatoire at St Petersburg and I had a student card which meant that I could go the Mariinsky Theatre quite cheaply and that is where I got the bug. I realised I either had to work in this industry or find an oligarch!" Fortunately Sophie, of Chelmsford in Essex, was able to go for the work option, joining WNO in January. She is the first to admit that cut price tickets were her route into opera. "The reason I went to opera first of all was because it was cheap," says Sophie. "My student card made it affordable. That is a great way to get people in and get them hooked." Polly Graham, who is currently on a two year placement with WNO as assistant director sponsored by the Genesis Foundation, has her family to thank for introducing her to opera. "I got taken to a WNO Madam Butterfly when I was about nine and I can just remember crying, crying and crying. My family are really into opera and they would take me to see things and I always enjoyed it. We lived in Gloucestershire near to the RSC so I was spoon-fed the arts from a very young age." For Polly, knowledge is the key. "I have done education work with ENO and I have been doing family workshops here with WNO and these are all ways to break down stigmas about opera. Once you get people into the building and into watching opera then it is fine." Twenty-eight-year-old Polly, who is mum to two-year-old Gabriel, adds: "Opera is very exciting. You have got so many forces working together to express something at a sophisticated level. That is why it is such a fascinating art form and so engrossing. It is so exhilarating when you get it right." *WNO perform Tosca on November 12 and 16, Anna Bolena on November 13, Maria Stuarda on November 14 and Roberto Devereux on November 15 at Birmingham Hippodrome. There are free pre-performance talks before all The Tudors operas and a free 'new to opera' talk before Tosca on Nov 16. Tickets - 0844 338 5000 or online.